Last Friday I went to the grand opening of the Showare Center in Kent, WA. Showare is a ticketing company like Ticketmaster. The Showare Center is the new home for the Seattle Thunderbirds junior hockey team that for the last few years has played in Key Arena in Seattle. Attached are pictures I took at the opening. For the open house they had a stage on the ice. 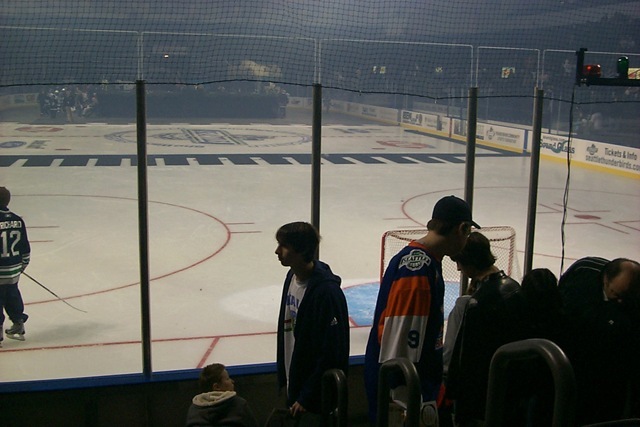 This is a photo from my seats which are six rows behind the glass, behind the goal. A few photos of the home team locker room. Nice space for each team member (but only four showers). 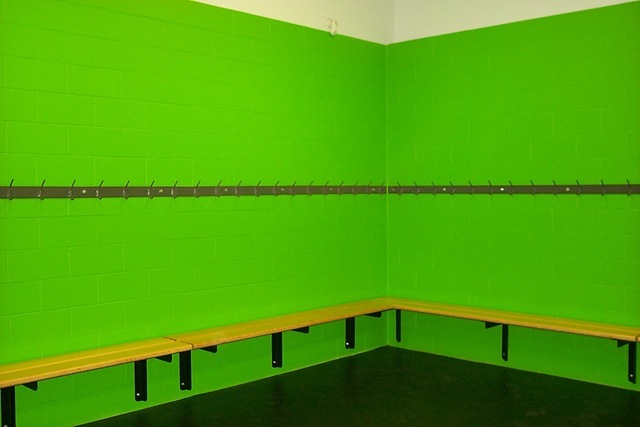 The visiting team locker room is basically bare with this lovely shade of green. Note the little hooks to hang things on compared to the home team locker room. 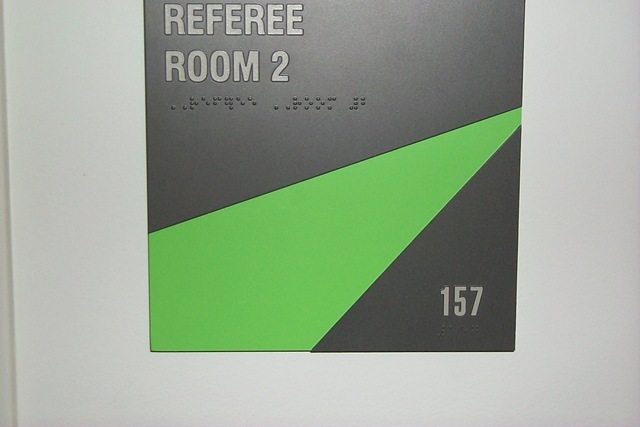 Hopefully you can notice the Braille on the referee locker room sign. This proves that in fact that the referees do have problems with their site. 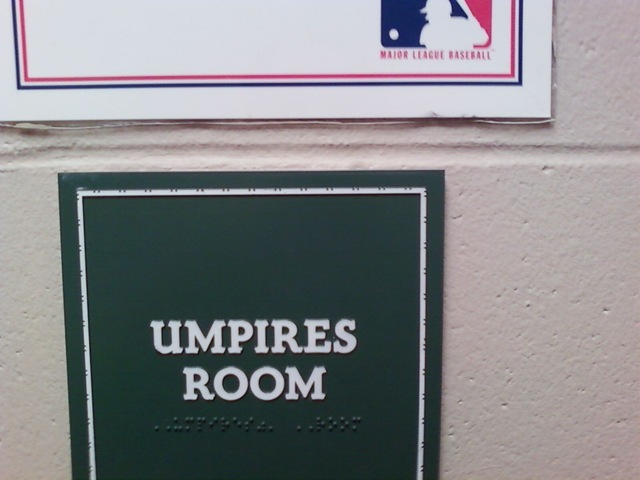 The umpire room at Safeco Field also has Braille on the room door. Update: I was able to grab a photo of the Umpires room at Safeco today. 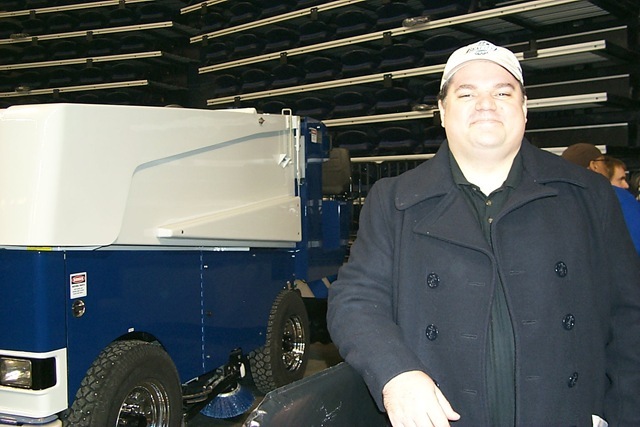 Me and the T-Birds Zamboni. 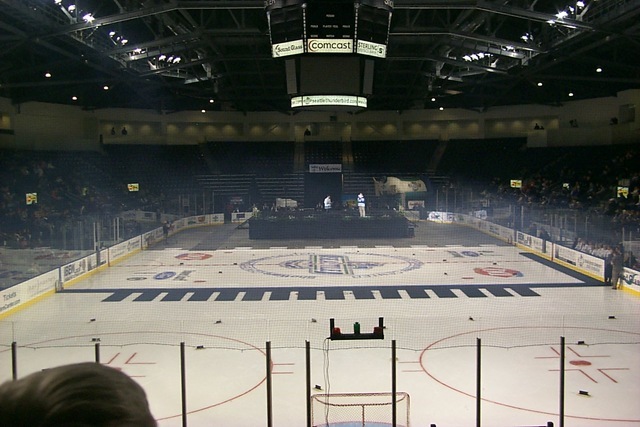 Pros: Showare Center is small so you have great sightlines from most places in the venue, including the suites at the top. I really think it will give the T-Birds more of a home ice advantage. It also will be nice for concerts assuming that the sound does not echo. It seats 6100+ for hockey and less than 8000 for a concert. This makes it about 2000 smaller than the Everett Event Center. Kent Station is near by which has some decent restaurants like Dukes or The Ram. The paperwork with our season tickets said we should not park there but I have no idea on how they would know you did and went to game. If you can park there and go to the movie theatre it would be just as long to go to a game. Cons: When it is sold out it will be hard to move around. At the first game the lines were long for concessions and you really could not move around the concourse. The second game which was an average game crowd size made it easier to move around. 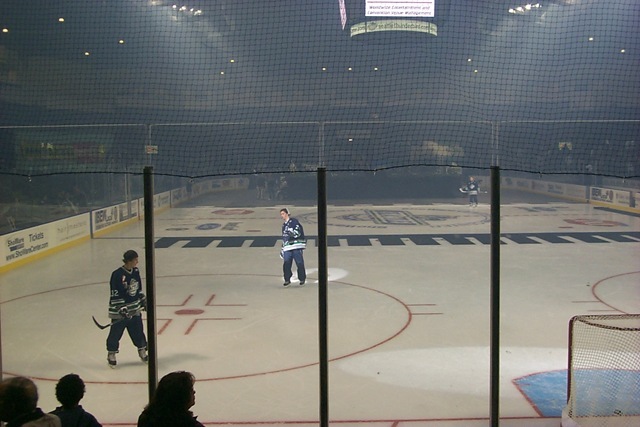 At Key Arena I had the habit of making loops around the concourse between periods just to get a little walk in. In Showare you cannot make full loops as one end is closed off from walking through. You can go from ground level, up steps to the top and go over two sections and walk back down however. The main parking lot only holds less than 900 cars. There is the old park and ride lot less than two blocks away to offset this and in either case chances are you will have less of a walk than you did at Key Arena but do not expect to park close unless you get their early. In theory they do have spots set aside for carpools and hybrid cars but I have not seen it in practice. I tend to think that they might not have enough bathrooms. On opening night there were long lines, even for the guys, when you compare to Key Arena. I only counted four stalls. Overall however it is a nice building. It was built at a low cost and should do well for the T-Birds, Disney on Ice, Harlem Globetrotters, etc. type of events. It is far from being a fancy venue. This entry was posted in Seattle sports. Bookmark the permalink.